This lab uses the glenco simulator, Virtual Lab: Population Biology to collect data on two populations of paramecium, P. caudatum and P. aurelia. Though the simulator doesn’t expressly say it, the activity illustrates the competitive exclusion principle by showing students how each population behaves when grown alone or when mixed together. In the mixed culture, one of the populations does not survive. 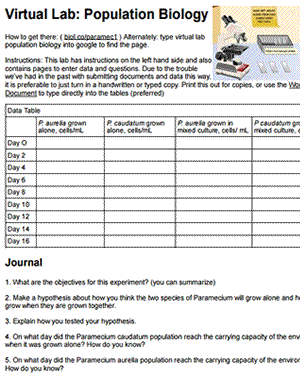 The worksheet includes questions that go with the lab, though the simulator does have a journal included with it where students can type their answers and print them out. I experienced some difficulty with this feature, so now have students write out their answers on this handout and have included additional questions that complement a typical ecology unit on competitive exclusion and niche partitioning.